"The fresh and vibrant tastes of spring shine through this sandwich made with flavored cream cheese, radish, arugula, and tomato. It's a quick, easy, and healthy lunch." Mix the cream cheese, lime juice, balsamic vinaigrette, salt, and pepper in a bowl. Spread the mixture evenly over one of the bagel halves. 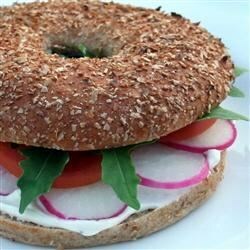 Arrange the radish slices, arugula, and tomato on top of the cream cheese. Sandwich with the remaining bagel half. This grilled sandwich is so hearty, you could almost call it "meaty." I added a splash of my favorite white balsamic vinegar to the vinaigrette. Also, common sense dictates you toast the bagel first. Raw bagels are nasty! A great sandwich for a light lunch, I did toast the bagel but otherwise followed the recipe. The radishes are especially good here. Thanks for sharing!